← Ni’s Pattern Design 02: Florals Pattern Designs! 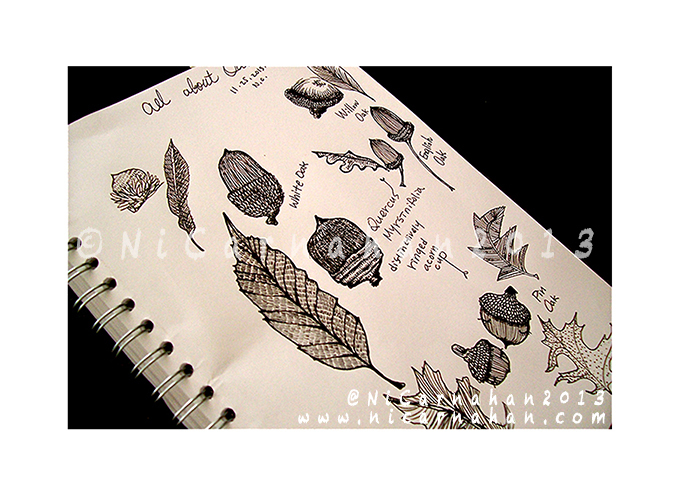 Inspired By Nature Sketches: All About Acorns!! ©Ni Carnahan 2013 All Rights Reserved. I am in love with Oak trees and acorns!!! For me, they are so unique and inspiring. I have been sketching all shapes and types of oak tree leaves and acorns lately. This is another project of mine that I have been preparing for over 2 years now. I hope that I will finally be able to introduce this project with you all when I am ready. For me, I believe in taking your time and effort to prepare each project that meant so much to yourself. My motto is trying all sort of possibilities and put as much of effort into researches, sketches, and eventually create your own versions of your project that you are working on. I have been developing this special project of mine for over 2 years now,yet I am still not ready yet. I hope to introduce this project with you guys sometime next year. In the meantime, I will share my sketches along the way.